The Frontier Fields survey is a pioneering observational program aimed at collecting photometric data, both from space (Hubble Space Telescope and Spitzer Space Telescope) and from ground-based facilities (VLT Hawk-I), for six deep fields pointing at clusters of galaxies and six nearby deep parallel fields, in a wide range of pass-bands. The analysis of such data is a natural outcome of the Astrodeep project, that focuses on developing methods and tools for extragalactic photometry and create valuable public photometric catalogues. We present complete multi-wavelength photometric catalogues (from B band to 4.5 µm) for the first two of the Frontier Fields, Abell-2744 (A2744 hereafter) and MACS-J0416 (M0416), plus their parallel fields. A2744 and M0416 image datasets are the first 2 publicly released of a total of 6 twin fields, observed by HST in parallel (i.e. the cluster pointing together with a “blank” parallel pointing) over two epochs, to a final depth of 140 orbits per field (FF program 13495, P.I. Lotz). The A2744 dataset also includes data acquired under programs 11689 (P.I. Dupke), 11386 (P.I. Rodney), and 13389 (P.I. Siana). The M0416 dataset combines the FF program data with imaging from the CLASH survey (P.I. Postman) and program 13386 (P.I. Rodney). The HST dataset consists of the following 3 optical and 4 near-infrared bands: B435, V606 and I814W (ACS); Y105, J125, JH140 and H160 (WFC3). We use the final reduced and calibrated v1.0 mosaics released by STScI (0.06″ pixel-scale). A detailed description of the acquisition strategy and of the data reduction pipeline, as well as the final number of orbits in each band, can be found in the STScI data release documentation. Additional information redward of WFC3 H160 band is a fundamental ingredient for selecting and investigating extragalactic sources across a wide redshift range. We use the publicly released Hawk-I@VLT Ks images of the A2744 and M0416 fields (P.I. Brammer, ESO Programme 092.A-0472 3 ), resampled to the HST pixel scale. Finally, we include IRAC 3.6 and 4.5 µm data acquired under DD time and, in the case of M0416, Cycle-8 program iCLASH (80168, P.I. Capak). 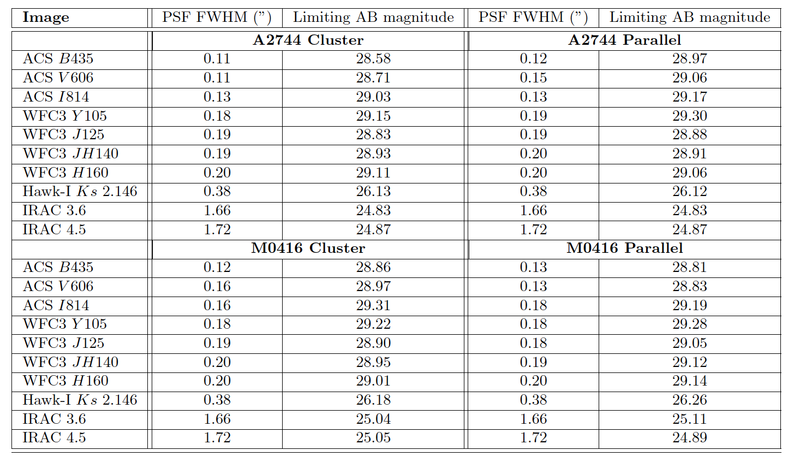 In the following Table we list Point Spread Function (PSF) FWHM and depths of all the imaging data used. PSF FWHM and depths of the dataset we used. Schematic description of the procedure applied to “clean” the cluster images removing the light from the foreground bright sources. Effects of the procedure on the A2744 (top) and M0416 (bottom) H160 image. 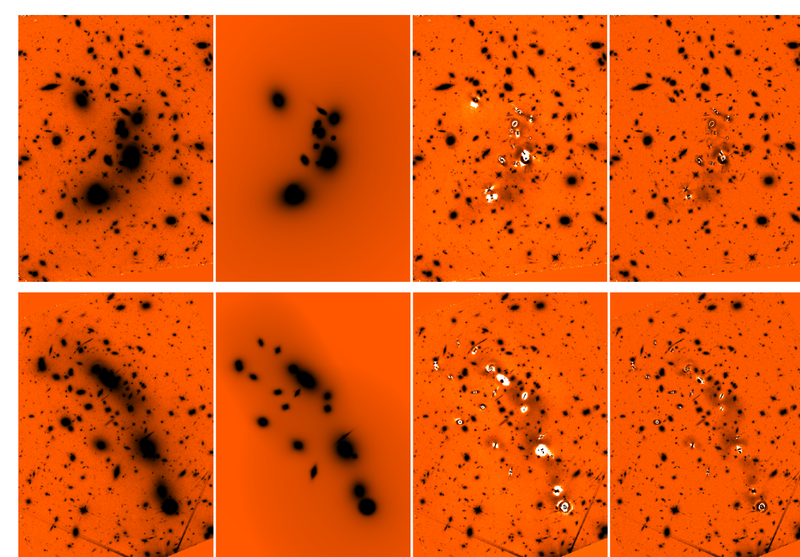 Left to right: original image, models of galaxies and ICL after STEP4, processed image after subtraction of the models, final processed image after median filtering (STEP5). All images have logarithmic grey-scale with the same cuts. On the residual images, we perform the detection on the HST H160 image to obtain a pure H-selected sample. We also add a sample of sources which are undetected in the H160 image but appear on a stacked infrared image (Y+J+JH+H). Photometry in the other HST bands has been obtained using SExtractor (Bertin et al. 1996) aperture photometry, performed again on processed images after the procedure for foreground light removal. Photometry on the Hawk-I and IRAC bands has been obtained using our PSF-matching deconfusion code T-PHOT (Merlin et al. 2015). T-PHOT uses the spatial and morphological information from a high-resolution image as priors to construct low-resolution normalised models. The code allows to fit real sources together with analytical models, therefore we can simultaneously fit faint sources with models of the bright cluster members. The residuals after T-PHOT fitting are displayed in the following Figure. A2744 residuals after T-PHOT processing. 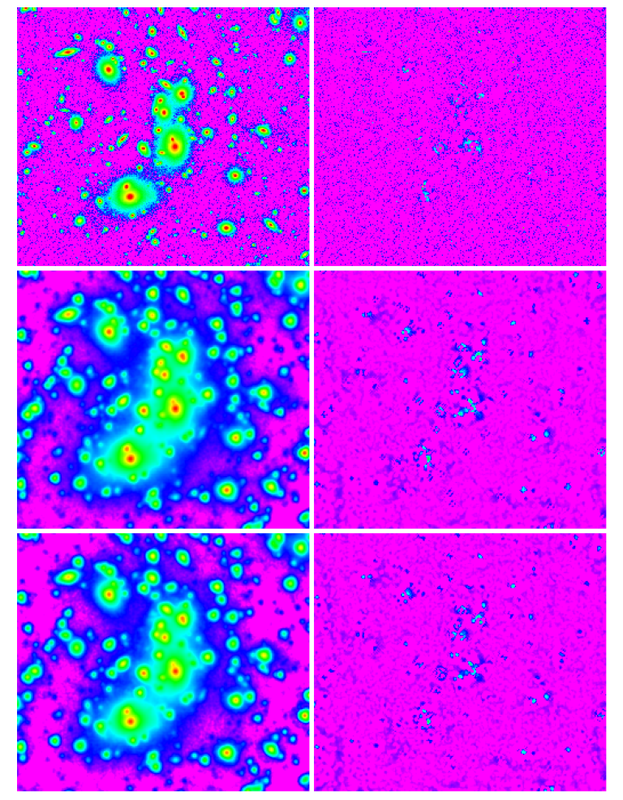 Left to right, top to bottom: original and residual images of K, IRAC-ch1 and IRAC-ch2 (logarithmic scale). A similar strategy, but without the need for the foreground light removal, is adopted for the Parallel fields. The procedure for foreground light subtraction allows for the detection and the photometric measurements of ~2500 sources per field. All objects have multi-wavelength coverage including B to H HST bands, plus K from Hawk-I, and 3.6 – 4.5 µm from Spitzer. Full and detailed treatment of photometric errors is included. We perform basic sanity checks on the reliability of our results. Our procedures allow for the detection of outshined objects near the bright galaxies, almost doubling the number of detected sources with respect to a standard detection procedure. This, coupled with the magnification effect of the clusters, can reveal extremely faint high redshift sources. The light-removal procedure and the multi-wavelength photometric catalogues are described in detail in Merlin et al. (2016). The catalogues are publicly available (here) and are ready to be used for scientific purposes. Raw number counts of detected objects on the detection images. Top panel: A2744; bottom panel: M0416. Black lines refer to the cluster fields, blue lines to the parallel fields; solid lines refer to the H detected catalogue, dashed lines to the additional IR-stack detected catalogue. For reference, the red lines refer to CANDELS fields number counts re-scaled to the FF area (solid: Goods-S, dashed: UDS). We exploit this multi-wavelength catalogues to derive photometric redshifts and physical properties of all detected sources. To minimise systematic errors, median photometric redshifts are assembled from six different approaches to photo-z estimates: 1) OAR ; 2) McLure ; 3) Mortlock ; 4) Parsa ; 5) Marmol-Queralto-1 ; 6) Marmol-Queralto-2. The OAR photometric redshifts are obtained with our zphot.exe code following the well-tested procedure described in Fontana et al. (2000) and Grazian et al. (2006). Best fit photo-z‘s are obtained through a χ2 minimisation over the observed HST+IR bands using SED templates from PEGASE 2.0 (Fioc & Rocca-Volmerange 1997) at 0.0< z< 10.0. The Parsa and Mortlock runs both use the publicly available Le Phare code (Arnouts et al. 1999), and employ the PEGASE and zCOSMOS (Ilbert et al. 2006) template sets respectively. The Marmol-Queralto runs both utilise the publicly available EAZY code (Brammer et al. 2008) and employ the PCA (built following Blanton & Roweis 2007) and PEGASE template sets respectively. The McLure run is based on his own proprietary code, as described in McLure et al. (2011), which employs Bruzual & Charlot (2003) templates. All of the photometric redshift runs with the exception of the OAR one applied adjustments to the photometric zeropoints and the McLure, Parsa and Mortlock runs included strong nebular emission lines in the SED fits. To minimise systematics due to the use of a single approach we set as reference photo-z for each object the median value from the six available estimates. Their reliability is assessed through a comparison with available spectroscopic samples. Publicly available lensing models are used to derive magnification values on an object-by-object basis by taking into account sources positions and redshifts. 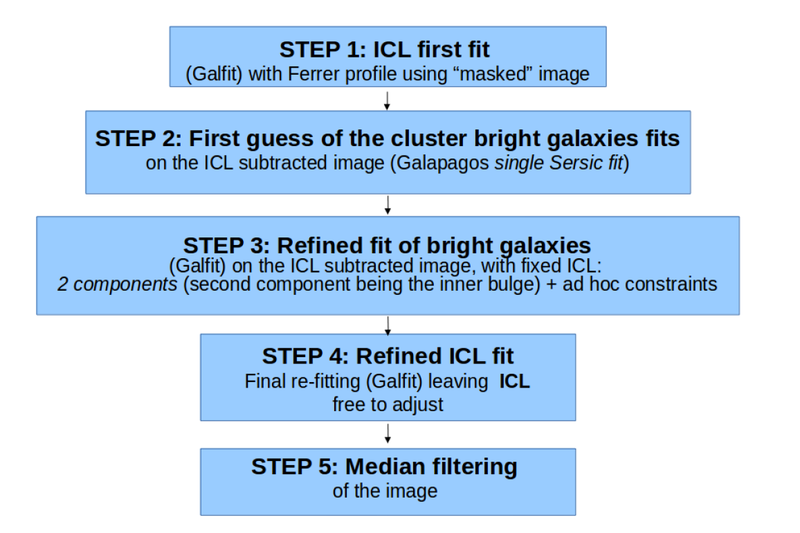 The released catalogues aim at providing a reference for future investigations of the extragalactic populations in these legacy fields: from lensed high-redshift galaxies to cluster members themselves. The median photo-z‘s reach a remarkable 3-5% accuracy. After accounting for magnification the H band number counts are found in agreement at bright magnitudes with number counts from the CANDELS fields, while extending the presently available samples to galaxies intrinsically as faint as H160∼32-33 mag, thanks to strong gravitational lensing. The Frontier Fields allow to probe the galaxy stellar mass distribution at 0.5-1.5 dex lower masses, depending on magnification, with respect to extragalactic wide fields, including sources at M*=10^7-10^8M at z>5. Similarly, they allow the detection of objects with intrinsic SFRs >1dex lower than in the CANDELS fields reaching 0.1-1 Msun/yr at z∼6-10. The photometric redshift catalogues and derived quantities are described in detail in Castellano et al. (2016), are publicly released and can be downloaded here. Demagnified H160 number counts in the cluster fields. Magenta and red continuous curves refer to A2744 and M0416 H-detected sources respectively after excluding all objects with photo-z consistent with the redshift of the clusters. Magenta and red dashed lines show the demagnified number counts of additional IR-detected sources (with S/N(H160)>1) in each field. As a comparison, number counts normalized to the FF area from the public CANDELS GOODS-South (Guo et al. 2013) and UDS (Galametz et al. 2013) catalogues are shown as continuous and dashed blue lines respectively. The green lines are number counts from randomly chosen portions of the CANDELS GOODS-South and UDS field having the same area as the FF pointings. 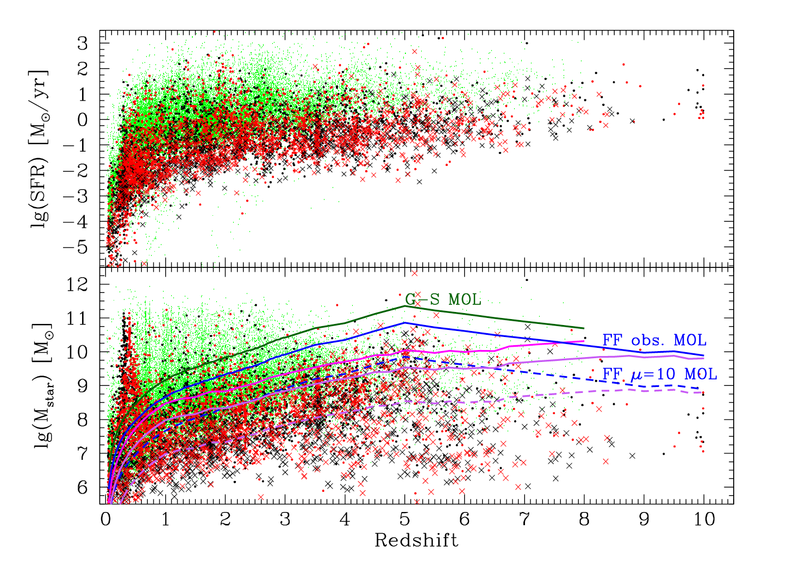 Top panel: Demagnified SFR as a function of redshift in the A2744 (black) and M0416 (red) clusters. Filled circles and crosses refer to H-detected and IR-detected sources respectively. For reference SFRs of objects from the CANDELS GOODS-South field are shown as green dots. Bottom panel: demagnified stellar masses, same symbols as above. The continuous and dashed blue lines show the limiting Mstar for a “maximally old model” at H160=27.25 (observed 90% completeness limit) and H160=29.75 (90% completeness limit for =10). The continuous and dashed lines show the corresponding “completeness corrected” limiting Mstar (see text for details). The dark green and magenta continuous lines show the “maximally old” and completeness corrected limiting Mstar of CANDELS GOODS-South from Grazian et al. (2015). In the following links you may find all catalogs produced by the Astrodeep collaboration. 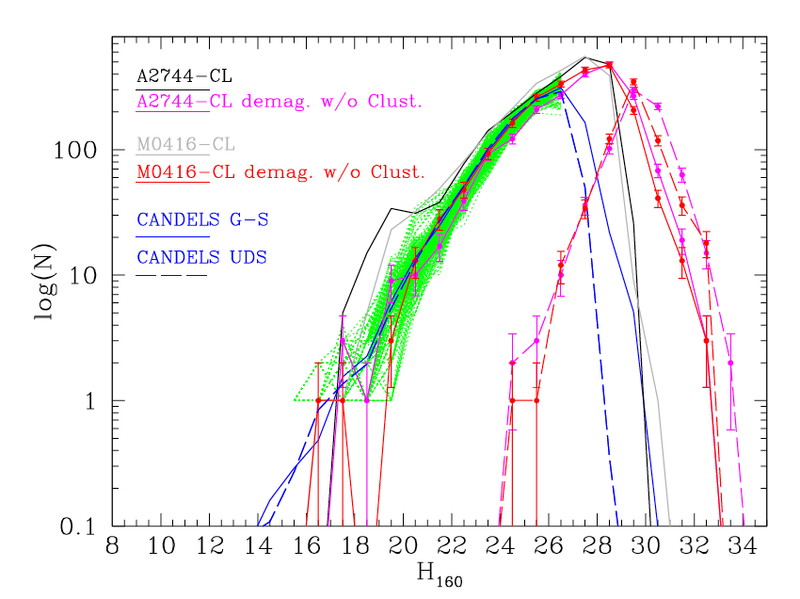 Abell 2744 cluster : A tar containing the multi wavelength catalogs and photometric redshift information of the Abell 2744 cluster. Abell 2744 parallel: A tar containing the multi wavelength catalogs and photometric redshift information of the Abell 2744 parallel field. 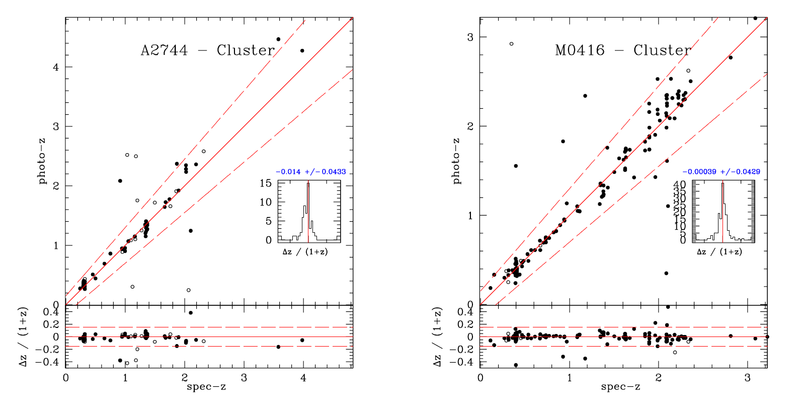 MACSJ 0416 cluster: A tar containing the multi wavelength catalogs and photometric redshift information of the MACSJ0416 cluster. MACSJ 0416 parallel: A tar containing the multi wavelength catalogs and photometric redshift information of the MACSJ0416 parallel field. A detailed description of the four catalogs contained in each tar file including column information can be found here.